What Russia comprises has changed over time from the Russian Empire, the Soviet Union, the Russian Federation—and ethnic Russia (see video below). Until the 1720’s, there were few Jews in the Russian Empire while Christian hostility saw them forbidden from settling in the interior. Only in the early eighteenth century with westwards expansion, did Jews began to move into the Russian Empire, though not into Russia proper. Especially after Catherine the Great took part in the division of the Polish-Lithuanian Commonwealth (1772, 1793, 1795) did the Russian Empire gradually include the largest Jewish population in the world which applied until after World War I. In this century and a half most Jews lived not in ethnic Russia itself but in the Lithuanian, Belorussian, and Ukrainian provinces of the Russian Empire and Poland. Throughout the nineteenth century Jews settled legally and illegally in Saint Petersburg, Moscow and other Russian cities. In the Soviet period, at first hundreds of thousands and then millions of Jews migrated to the interior provinces of Russia. This continued in the post-Soviet period. The Russian Pale was the largest ghetto in the world. It came into existence after the Partition of Poland in the 18th century to allow people, who were banned from Russia, to stay where they were . At the end of 19th century almost 5,00,000 lived there. Antisemitism saw high emigration to other countries including what was then Ottoman Palestine and was the start of the Zionist movement. Alexander II (1855–1881), expanded Jewish integration into the state and outlawed child conscription. Residence outside of the Pale of Settlement was expanded, and economic and educational restrictions lifted. Their pace slowed in the latter part of his reign and reversed, after his assassination in 1881 His son, Alexander III (1881–1892) attempted to turn Imperial Russia effectively into a police state by reversing his father’s liberal policies including those toward the Jews. Jews were increasingly blamed and penalized for the economic difficulties of the Russian state, and most importantly, for the rise of the revolutionary movement. These problems and the 1881-2 Ukraine pogroms saw increased emigration to the West and the birth of modern Jewish nationalism. Kiev from 1911 to 1913 saw probably the most famous blood-libel case in modern history, alleging a Kievan Jew had slaughtered a young Christian child for ritual murder. Though covered by the world press the Russian government campaigned for his conviction. He was acquitted by a jury of non-Jews. The case was seen as both proof of the enormity of Russian anti-Semitism and the strength of the anti-tsarist forces in Russian society. Contradictions intensified in the last years of Nicholas II’s rule. While regulations governing elections limited the franchise of Jews; the Russian government was forced to abolish the Pale of Settlement in 1916. The Romanov dynasty disintegrated in February–March 1917. The new Provisional Government abolished all laws discriminating against any Russian citizens on the basis of religion or nationality; thus, the Jews were emancipated. Pogroms were unleashed throughout the Russian Civil War, perpetrated by virtually every competing faction, from Polish and Ukrainian nationalists to the Red and White Armies. The Soviet authorities considered the use of Hebrew language "reactionary" since it was associated with both Judaism and Zionism, and the teaching of Hebrew at primary and secondary schools was officially banned Yiddish, rather than Hebrew, would be the national language, and proletarian socialist literature and arts would replace Judaism as the quintessence of culture. The Soviet authorities considered the use of Hebrew language "reactionary" since it was associated with both Judaism and Zionism, and the teaching of Hebrew at primary and secondary schools was officially banned by the Narkompros (Commissariat of Education) as early as 1919, as part of an overall agenda aiming to secularize education. In 1928 an alternative to Israel was established called the Jewish Autonomoblast with its center in Birobidzhan in the Russian Far East was to become a ‘Soviet Zion’. Yiddish, rather than Hebrew, would be the national language, and proletarian socialist literature and arts would replace Judaism as the quintessence of culture. Despite a massive domestic and international state propaganda campaign, the Jewish population in the Jewish Autonomous Oblast never reached 30% (in 2003 it was only about 1.2%). The experiment ground to a halt in the mid-1930’s, during Stalin's first campaign of purges. Jewish leaders were arrested and executed and Yiddish schools were shut down. The word "Jew" was avoided by the media when criticising Israel, which the Soviets often accused of racism, chauvinism etc. Instead the word ‘Israeli’ was used almost exclusively, so as to paint its harsh criticism not as antisemitism but anti-Zionism. Many of the increasing numbers of Soviet Jews applying to emigrate to Israel after the 1967 Six Day War, were refused permission to leave. A typical excuse was that they had information vital to Soviet national security and so could not be allowed to leave the country. In 1970, following local events, strong international condemnations caused the Soviet authorities to increase their emigration quota. From 1960 to 1970, only 4,000 left the USSR. In 1914 there were more than 5,250,000 Jews in the Russian Empire. By 2000 this had been reduced to 460,000. To understand the complex history of Jews in Russia, one must begin with a fundamental distinction, often effaced in the historiography and popular memory, between Russia as a state—the Russian Empire, the Soviet Union, and since 1991, the Russian Federation—and the geographically much smaller entity of ethnic Russia. Until the 1720’s, there were essentially no Jews in the Russian Empire except for travellers and migrant merchants, and the Russian state forbade Jews from settling in its interior, out of traditional Christian hostility. It was only in the early decades of the eighteenth century, when the rulers of the Russian Empire started to expand westward, after more than a century of eastward inroads and annexation (into territories in which Jews did not live), that Jews began to move into areas of the Russian Empire—not Russia proper. Thus, after Peter the Great conquered the areas connecting Muscovy and the Baltic Sea, and especially after Catherine the Great colluded with Prussia and Austria to divide and annex the Polish-Lithuanian Commonwealth (1772, 1793, 1795), the Russian Empire gradually included the largest Jewish population in the world—a reality that persisted until the division of this territory in the aftermath of World War I. In this century and a half, however, the vast majority of Jews did not live in ethnic Russia itself but in the Lithuanian, Belorussian, and Ukrainian provinces of the Russian Empire, and in the Kingdom of Poland, a region controlled by the tsars but not formally annexed to the empire. Throughout the nineteenth century, and especially in its latter half, Jews with special privileges settled legally in Saint Petersburg, Moscow, and other Russian cities, where they were joined by larger numbers of Jews living there illegally. In the Soviet period, at first hundreds of thousands and then millions of Jews migrated to the interior provinces of Russia, particularly to the capital cities of Moscow and Leningrad. The substantial presence of Jews in these cities (with Leningrad reverting to its imperial name of Saint Petersburg) and in other parts of Russia continued in the post-Soviet period. THE RUSSIAN STATE THE PALE AND THE JEWS. Scholarly literature has described the history of the relationship between Jews and the Russian state in two fundamentally opposing ways. The traditional school, founded by the historian Simon Dubnow in the late nineteenth century, saw Jews as the preeminent victims of tsarist autocracy, whose treatment of the Jews was marked and defined by governmental antisemitism. Dubnow deemed the areas of the empire in which Jews were permitted to live—the so-called Pale of Settlement—the largest ghetto in the world, and considered all tsarist legislation regarding Jews as motivated by prejudice and hatred, culminating in pogroms that broke out against Jews in the late imperial period ostensibly orchestrated by the Russian government itself. This view entered into the popular consciousness and has shaped the way in which the descendants of Russian Jews have viewed their own history for over a century. In sharp contrast, a new school of Russian Jewish history writing emerged in the 1970’s and 1980’s, first in the United States, then in Israel and finally in post-Soviet Russia itself. This school views the Russian state‘s treatment of Jews comparatively, as part of the overall nationalities policy of the empire, a policy always marked by contradiction and bureaucratic ineptitude. In this view, antisemitism was not the motivating force of the government’s treatment of Jews, which in general was consistent with, or in some cases milder than, its treatment of other groups. Jews were largely permitted to continue their traditional way of life and education of their young, as opposed to other minorities whose native languages and school systems were outlawed by the state. Perhaps most controversially, the new school of Russian Jewish historiography argues that pogroms against Jews were not orchestrated or even approved of by the state, but were rather spontaneous and unplanned outbreaks of urban violence caused by social and economic forces beyond the control of the Russian army or police. Most broadly, Russian government policy toward Jews can be understood as the product of an unresolved tension between integration and segregation—a tension that resulted in contradictory laws and regulations, persisting from the days of Catherine the Great (r. 1762–1796) to the fall of the Romanov dynasty in the winter of 1917. Catherine’s legislation regarding Jews at one and the same time fostered their segregation from the rest of the population by ratifying their communal autonomy and religious institutions and encouraged their integration into the new administrative institutions that she was creating—merchant guilds, urban government, and legally defined artisan associations. The new classification of the Russian population did not define Jews as an independent estate (called a soslovie in Russian), but included them in urban estates: either in the townspeople estate (meshchantstvo) or, if they were wealthy enough, in the merchant guilds (kupechestvo). However, the fact that in many areas, and particularly in the Ukraine, Jews lived overwhelmingly in villages and rural settlements contradicted Catherine’s policies from their inception because rural residence was forbidden to members of the meshchantstvo estate. Thus, Jews were implicitly exempted from a basic prohibition incumbent upon most members of their estate. Periodically, this exception was lifted and Jews were banned from the countryside and forced to move to towns and cities; these actions (never terribly successful) were regarded by the Jews (and by some later historians) as discriminatory and oppressive. In general, the basic rules regarding Jewish residence constituted an inchoate mixture of integrationist and segregationist intentions and realities: in a state and legal system in which no one enjoyed the natural right to live anywhere and where residence was regarded as a privilege extended by the state, Jews were permitted to reside in the areas of the empire in which they had lived at the time of annexation; legislation soon formalized these areas into the Pale of Jewish Settlement. The tension between integration and segregation in Catherine’s legislation on Jews was only exacerbated in the latter years of her reign, when in response to the French Revolution she retreated from Enlightenment-based policies of reform and toleration. The brief reigns of Peter III (1796) and Paul I (1796–1801) had little effect on Jewish policy, and the same held true for the reign of Alexander I (1801–1825), during which Jews basically retained the legal status they had held under Polish rule. Alexander I announced a new policy of offering Jews free land to work as farmers if they converted to Russian Orthodoxy, but this offer was not popular. Still, despite the lack of governmental initiative regarding Jews in these decades, the reality that they were living in a state vastly different from that of the destroyed Polish–Lithuanian Commonwealth slowly began to become clear to the Jews. In 1803, the Russian government under Alexander I issued its first complete compilation of laws relating to Jews, known as the Polozhenie (Regulations) of 1803, but these had little practical effect on the Jewish community. More substantive was the invasion of the territory of the Pale of Settlement by Napoleon I in 1812, which resulted in legal changes in the Polish parts of the empire. But with the defeat of Napoleon, the situation returned to the status before the invasion. The reign of Alexander II (1855–1881), the Tsar Liberator, retained and expanded the policy of integration of the Jews into the Russian body politic, but under a far more liberal guise than that of his predecessor: conscription of children was outlawed, Jewish residence outside of the Pale of Settlement was expanded, and economic and educational restrictions against the Jews were lifted. Many Jewish intellectuals expected an imminent emancipation of the Jews as part of the Great Reforms that had remade Russian society and governance. But such emancipation was never forthcoming, and indeed, the pace of reform slowed substantially in the latter years of Alexander II’s reign. Moreover, all of these efforts were reversed, after his assassination in 1881 by revolutionary terrorists, and the assumption to the throne of his son, Alexander III (1881–1892). Attempting to turn Imperial Russia effectively into a police state, the new emperor committed himself to stemming the tide of revolutionary sentiment in the country by reversing his father’s liberal policies in all areas of life, including toward the Jews. The pendulum of integration versus segregation now swung back: new restrictions limited the number of Jews permitted in Russian educational institutions and in the professions, most especially the bar; Jews were increasingly blamed and penalized for the economic difficulties of the Russian state, and most importantly, for the rise of the revolutionary movement. Although, as mentioned above, current scholarship believes that the pogroms that broke out against Jews in Ukraine in 1881–1882 were not planned nor even approved of by the government, the anti-Jewish legislation of the state contributed to the nearly universal perception that these attacks were either contrived by or at least condoned by the tsarist regime. In 1882, the government issued laws aimed at reducing Jewish presence in the villages of the Pale of Settlement; these were known as the May Laws. Though frequently misinterpreted as prohibiting all Jewish settlement in villages, they in fact pertained only to new Jewish settlement outside towns and cities. After the issuance of these laws, the tsarist regime established a number of committees to investigate the status of the Jews in the Empire, the most noted and long lived of which was the Pahlen Report, which lasted from 1883 to 1886 and recommended even more restrictions on the status of the Jews in the Empire. Similarly, the perception began to grow that both the growing emigration of Jews from the Russian Empire to the West and the beginnings of modern Jewish nationalism—movements that actually predated the outbreak of the pogroms—were caused directly and unilaterally by the antisemitic policies of Alexander III. This perception—transmuted into a virtual historical truism by Simon Dubnow and his followers, as well as by the adherents of the new nationalist movements—shaped the image of the Russian state’s relationship to Jews for decades to come. The reign of the last tsar, Nicholas II (1892–1917) was marked by a radical and highly complex swing from policies favoring segregation to those favoring integration of Jews. For the first 13 years of Nicholas II’s rule, restrictions against Jews were retained and in some cases, intensified. During Passover of 1903, a major pogrom occurred against the Jews of Kishinev, then the capital of Bessarabia (now Moldova). Dozens of Jews were murdered and an unknown number raped. Although contemporaries at the time universally believed that the Russian government was either responsible for or sympathetic to this pogrom, recent research has argued that neither of these were the case; more causal was the low number and incompetence of Russian army forces and local militia in the area. But the pogrom was an enormous shock to the belief in the emancipation of the Jews in Russia then held by most Russian Jews, led to the organization of Jewish self-defense organizations, and likely accelerated emigration. After the Revolution of 1905, however, in the wake of which the tsar was forced to grant a measure of constitutional liberty to his subjects, many restrictive laws limiting Jewish participation in Russian civic life were eliminated. Jews were permitted to vote in elections to the new parliament and to form legal political parties. Thus, again in sharp contrast to the experience of Jews in the West, Jews in the Russian Empire effectively gained political rights before they were legally emancipated—perhaps the most glaring example of the persistent tension between integration and segregation. In Kiev from 1911 to 1913 there took place perhaps the most famous blood-libel case in modern history, alleging that a Kievan Jew, Mendel Beilis, had slaughtered a young Christian child for reasons of ritual murder. This led to a trial that was covered by the world press, and although the Russian government steadfastly campaigned for a conviction of Beilis, he was ultimately acquitted by a jury of non-Jews. Some of the outstanding Russian and Russian Jewish lawyers of the period participated in his defense, which was interpreted ideologically as both proof of the enormity of Russian anti-Semitism and the strength of the anti-tsarist forces in Russian society. Contradictions intensified in the last years of Nicholas II’s rule. On the one hand, regulations governing elections increasingly limited the franchise of Jews; on the other hand, as Russia entered the World War and the regions in which the largest Jewish population in the world were engulfed in battle, the Russian government was forced to abolish the Pale of Settlement in the summer of 1916, as a temporary measure aimed at dealing with the hundreds of thousands of Jews fleeing the battlefront and flooding the interior of Russia. At the same time, more than half a million Jews served proudly and bravely in the Russian army, even as their coreligionists faced charges of disloyalty and even treachery by the High Command. Thus, to the very last days of the existence of the Russian Empire, the tensions and contradictions between integration and segregation of Jews were manifested, until the Romanov dynasty itself disintegrated in February–March 1917. In one of its first acts, the new Provisional Government abolished all laws discriminating against any Russian citizens on the basis of religion or nationality; thus, the Jews were emancipated. Pale , (from Latin palus, “stake”), district separated from the surrounding country by defined boundaries or distinguished by a different administrative and legal system. It is this definition of pale from which the phrase “beyond the pale” is derived. 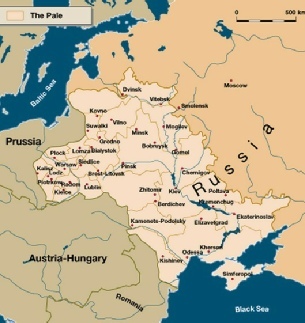 In imperial Russia, what came to be called the Pale of Settlement (Cherta Osedlosti) came into being as a result of the introduction of large numbers of Jews into the Russian sphere after the three partitions of Poland (1772, 1793, 1795). Adjusting to a population often banned from Russia altogether was a problem that Russian leadership solved by allowing Jews to remain in their current areas of residence and by permitting their settlement in areas of the Black Sea littoral annexed from Turkey, where they could serve as colonists. In three decrees, or ukases, issued in 1783, 1791, and 1794, Catherine II the Great restricted the commercial rights of Jews to those areas newly annexed. In ensuing years, this area became a strictly defined pale, as legal restrictions increasingly proscribed Jewish settlement elsewhere in Russia. During the 1860s a few exceptions were made to the increasing restriction of Jews to settlement only in the pale—which by the 19th century included all of Russian Poland, Lithuania, Belarus (Belorussia), most of Ukraine, the Crimean Peninsula, and Bessarabia. Some merchants and artisans, those with higher educations, and those who had completed their military service could settle anywhere but in Finland. In the 1880s, however, the pendulum swung back toward restriction. A period of reaction arrived with the ascension of Tsar Alexander III in 1881. That year, the new tsar promulgated the “Temporary Laws,” which, among many regressive measures, prohibited further Jewish settlements outside the pale; and Christians within the pale were allowed to expel Jews from their areas. Occasionally, new areas were proscribed, such as the city and province of Moscow in 1891. Nevertheless, the census of 1897 indicated that most Jews remained confined to the pale. 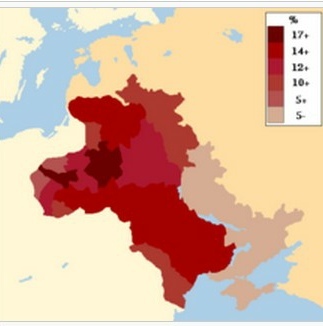 Almost 5,000,000 lived within it; only about 200,000 lived elsewhere in European Russia. The pale ceased to exist during World War I, when Jews in great numbers fled to the interior to escape the invading Germans. The Provisional Government formally abolished it in April 1917. As a consequence of both the incompetence of the tsarist bureaucracy and the Jews’ desire to avoid being counted for fiscal purposes, we have no accurate statistics about Jewish life in the Russian Empire prior to 1897, when the first the all-empire census was mounted. The best estimates propose that the Jewish population at the time of the Polish Partitions was approximately 1 million, and this figure would increase fivefold by the end of the nineteenth century—the official (if still imprecise) figure in the 1897 census was 5,198,401 Jews living in the Russian Empire, including Congress Poland—a little more than 4 percent of the entire population. This number must be augmented by the nearly 3 million Jews who emigrated from the Russian Empire to the West from the 1870s to 1917. Thus, between 1772 and 1917 the Jewish population of this territory grew over eight times—an enormous increase, far greater than that of the non-Jewish population of the empire. Scholars have attributed this massive growth to a sharp diminution of the infant mortality rate—but, as yet, no one has successfully explained why the Jewish infant mortality rate dropped so precipitously over this period. In any event, this demographic reality of Russian Jewry, compounded by the political reality that compelled most Jews to live within the economically restricted area of the Pale of Settlement, had far-reaching social and economic implications. First, as the number of Jews living in their traditional areas of settlement expanded exponentially, substantial numbers of Jews began to migrate to other parts of the Russian Empire open to them—at first, mostly to the southwest, and especially to Odessa. At the same time, as the autonomy of the Polish Kingdom diminished until it was virtually eliminated in the latter decades of the nineteenth century, and hence the former Congress Poland was all but formally included into the Pale of Settlement, hundreds of thousands of Jews moved to the more economically advanced former Polish provinces as part of the so-called “invasion of the Litvaks.” Jews in large numbers also attempted to settle outside the Pale of Settlement, whether legally or not. All of these migratory movements were part of an overcharging urbanization process, as hundreds of thousands and then millions of Jews moved from villages to towns, from towns to cities, and then to larger and larger cities. This migration reflected not only demographic growth and the need for jobs, but also economic changes in the Russian Empire and particularly its western borderlands. There, the emancipation of the serfs, the introduction of railroads, and the fleeting attempts at government sponsored industrialization gradually displaced and all but eliminated traditional market economies. Thus, the vast numbers of Jews whose livelihoods had been based for centuries on serving as providers of goods and services to the peasantry at town markets, were now increasingly forced to seek alternate sources of income. Large numbers of Jews, including young women, began to work in small factories and workshops, while the owners of these factories and workshops joined the growing number of Russian Jews taking up white-collar professions and occupations. By the end of the imperial period, then, the social stratification of Jews in the Russian Empire had changed dramatically: while the vast majority of Jews were still in what can be deemed the lower middle classes, they were more and more impoverished; some Jews entered the industrial working class (though the extent of large-scale industrialization remained very small), and significant numbers entered into the prosperous middle classes and even into the upper middle classes. A tiny number of extraordinarily wealthy Jews became nobles. Their patents of nobility were almost always issued by German principalities and ratified by the Russian state. The tiny Jewish upper class and the larger but still relatively small middle classes were largely uninvolved in the last, if most famous, migratory movement of Russian Jewry—emigration to the West, and particularly to the United States. Although popular imagination continues to link this emigration exclusively to the pogroms against Jews in 1881–1882, demographic and economic historians have argued for decades that the emigration movement both preceded the pogroms and reflected—like all massive migration movements—social and economic, rather than political factors. The Jewish demographic explosion was exacerbated by a series of crop failures, famines, and downward cycles of the Russian economy that led millions of other—non-Jewish— residents of the empire to seek a solution to their economic problems outside of Russia. Technically, emigration was illegal in Russian law, but the government largely closed its eyes and at times encouraged emigration, which began slowly in the late 1860s, gained substantial momentum in the 1870s, and then reached massive proportions in 1880 and early 1881, before the outbreak of the first pogroms that spring. Undoubtedly, the pogroms provided an impetus to the emigration fever, and over the course of the next 33 years, approximately 3 million Jews would leave the Russian empire, mostly for America but also to England, France, and other parts of the West—as well as a tiny number for Palestine, connected to the Zionist movement. Demographers and historians are still trying to sort through the massive data relating to these emigrants, to determine their geographic, economic, social, and religious profiles. According to current research, the earliest waves of the Russian Jewish emigrants to the West seem to have come disproportionately from the northern provinces of the Pale (those, not incidentally, not directly affected by the pogroms that were concentrated in the south) and to have been males of working age; many seem to have first moved internally from areas of smaller to larger, habitation, and to have chosen emigration after that option did not work out. Since the rabbinical leaders of Russian Jewry emphatically inveighed against emigration either to America or to Palestine, the emigrants seem also to have been less devoted to traditional Judaism. All of these characteristics would change over the course of the decades, as this mass migration, like all mass migrations, snowballed from its original core group to larger and larger circles of Russian Jews. What seems true is that unlike other emigrants from the Russian Empire, greater percentages of women, children, and the elderly eventually joined the emigration, whose purpose was permanent relocation. The most crucial if little noted element of the story of Russian Jewish mass emigration is that it only accounted for one-third of the Jewish population of the empire—in other words, two-thirds of Russian Jews stayed home. Legal, demographic, social, and economic changes in the lives of Russian Jews went hand in hand with religious and cultural revolution in the nineteenth century and the first years of the twentieth century. Most Russian Jews to the end of the imperial period remained traditional in their daily life and praxis, but Russian Judaism was hardly static or immune—if in complex and often contradictory ways—to the influence of creeping modernity. In the 50 years between the Polish Partitions and the reign of Nicholas I, Hasidism spread like wildfire through most of East European Jewry, capturing the minds and hearts of the majority of Jews in Ukraine and Congress Poland, where the courts of Hasidic rebbes flourished, amassing great spiritual, political, and even economic influence. Only in Lithuania and Belorussia (strongholds of opposition to Hasidism and lumped together by the Jews as the term Lite) did Hasidism not win over the majority of the Jews, though even here important inroads were made by such groups as the Karlin Hasidim in the Pinsk region and the Habad movement, based in the small towns of Liubavich (Lubavitch) and Liady. The rabbinic and intellectual leadership of Lithuanian–Belorussian Jews—now called misnagdim or opponents of Hasidism (a paradoxical mark of the ascendancy of the latter! )—countered the appeal of Hasidism both ideationally and institutionally. Misnagdic leaders such as Rabbi Hayim ben Yitshak of Volozhin developed a new, more spiritualized theology that partook of Hasidic insights while remaining steadfastly committed to Talmudic intellectualism as the pinnacle and summum bonum of Jewish life. They also founded new types of highly intensive yeshivas that attracted students from all parts of Eastern Europe (and tiny numbers from the West as well). Such academies and their intellectual mentors attempted to stem the tide of secularization in Russian Jewish life, but some yeshivas— especially the most prestigious, the Volozhin yeshiva—ironically also served as the breeding ground for Haskalah among its students..
Over the course of the Imperial period, more and more Jews began to abandon traditional Judaism. While the ideals of the Haskalah, the Jewish enlightenment, were propounded only by small numbers of Jewish intellectuals—who eventually largely turned to the more radical movements of Zionism and socialism and their various intersections—the real lives of growing numbers of Russian Jews began to conform more and more to the goals of the enlightener's: first and foremost, millions of Jews in the Russian Empire began to speak Russian and to become consumers of Russian culture, even as they retained Yiddish as their mother tongue. More and more Jews began to attend Russian-language primary and secondary schools, and then universities as well. Just as in every other modern Jewish community, linguistic acculturation rigorously paralleled socioeconomic upward mobility and gender divides. This process of russification intensified in the Soviet period, when Russian rapidly became the primary tongue of most Russian Jews. In the Polish provinces of the empire, a similar process of polonization took hold among Jews. Acculturation was frequently accompanied by politicization. Although Hibat Tsiyon attracted a good number of Jewish intellectuals, it failed to make major inroads among the masses and appeared to be dying out in the 1890’s, until it was ineluctably transformed by the creation of the Zionist movement in the West by Theodor Herzl. Hundreds of thousands of Russian Jews became adherents of the new Zionist movement, especially under the aegis of Herzl’s opponent, the cultural Zionist thinker Ahad Ha-Am, but Zionism of any variety was vociferously opposed by the vast majority of East European rabbi’s, both Hasidic and misnagdic, who viewed the movement as heretical. They viewed with no less antipathy Jews attracted to the growing socialist movement. Socialism began to attract adherents among Russian Jews in the 1860’s and 1870’s and grew substantially in the aftermath of 1881–1882, and especially in the wake of the industrialization and proletarianization of hundreds of thousands of Jewish workers at the turn of the century. Soon, moreover, various groups emerged that attempted to forge a synthesis between Zionism and socialism, as well as a far smaller group that sought an amalgam between Zionism and Orthodox Judaism. An even smaller group of Jews, who viewed their Jewishness as entirely superseded by their commitment to socialism, joined—and sometimes achieved leadership positions—in the Bolshevik Party, just as a significant group of Jewish intellectuals and professionals joined the Russian liberal party, the Constitutional Democrats, known as the Kadets. The new nationalist intelligentsia, whether Zionist or socialist, found sources of expression in four new literary cultures created for and by Jews in the Russian Empire. First, the Haskalah movement engendered an enormously creative Hebrew literary renaissance, based especially in Vilna, Odessa, and Saint Petersburg, that numbered in its ranks scores of extraordinarily talented poets, essayists, novelists, and journalists. Though the scope of this culture was limited to those—mostly men, but also some women—who could read Hebrew, the success of this literary flowering can be gauged by the fact that in the late 1880’s and early 1890’s, there were two daily Hebrew newspapers in the Russian capital alone. By the 1890’s the literature included the works of the greatest Hebrew poet of the modern period, Hayim Nahman Bialik. A far larger audience was available for the nascent Yiddish literary movement, which also had its roots in the Haskalah but especially found support among a small group of intellectuals attracted by nationalist and populist thought. Particularly crucial to the success of modern literary culture in Yiddish were its three founding fathers—Mendele Moikher Seforim (Sholem Yankev Abramovitsh), Sholem Aleichem (Sholem Rabinowitz), and Y. L. Peretz. At the same time, as hundreds of thousands, and then millions of Jews were learning to read, write, and think in Russian (and smaller numbers in Polish), there emerged a fascinating Russian Jewish and Polish Jewish culture that fulfilled the needs of a growing number of Jewish youth who had a waning knowledge of Yiddish, and often no Hebrew training at all. These two cultures often appealed to Jews drawn to Russian and Polish liberal movements, which eschewed a Jewish separation while fighting for the emancipation of Jews (and all other minorities) within the Russian Empire. Between the Polish Partitions and the Russian Revolution, then, the largest Jewish community in the world had changed dramatically in every aspect of its existence. Russian Jewry was six times larger than it had been a century and a half earlier, and thus faced exceptional difficult economic and social challenges. It was rich and dynamic in cultural, religious, political, and literary creativity, but also more and more divided, and often bitterly, along new ideological and religious lines. Its legal and political status and relationship with a changing state and its institutions bore little resemblance to that of the early years of its entry into the Russian Empire. In sum, Russian Jewry in 1917 was both an extraordinary creative and a deeply troubled society, in ways no one could have anticipated and which scholars are still attempting to chronicle and analyze. The Black Hundred was another significant reactionary movement in tsarist Russia . Made up of dozens of smaller groups, less organised and more socially based than the Okhrana or political parties, the Black Hundred was fiercely conservative and pro-tsarist. In many respects it supported and attempted to enforce the Russification policy introduced by Alexander III in the 1880s. Composition of the movement was quite diverse: it was made up of aristocrats, businessmen, storekeepers, priests, petty bourgeoisie and large numbers of loyal peasants. The Black Hundred’s choice of motto, adopted from the tsar’s own slogan, reflects the basis of the movement’s ideology: samoderzhavie, pravoslavie, narodnost (‘autocracy, orthodoxy and nationalism’). Their symbols reflected their ideas: the Christian cross and the Romanov double-eagle (see the picture at right, of a Black Hundred procession). They called for and in some cases demanded devotion and loyalty to the tsar, the aristocracy and the Russian Orthodox church. More militant factions declared war on suspected revolutionaries and dissident groups, often physically through a thuggish sub-group called the Yellow Shirts. The bloody pogroms that occurred in Russia were a direct response by the czarist regime to the growing revolutionary movement of the working class. The government sponsored the formation of right-wing paramilitary squads, known as the Black Hundreds, to terrorize the working class. "As with the Fascist movements of inter-war Europe," writes the historian Orlando Figes, "most of their support came from those embittered lumpen elements who had lost—or were afraid of losing—their petty status in the social hierarchy as a result of modernization and reform: uprooted peasants forced into the towns as casual laborers; small shopkeepers and artisans squeezed by competition from big business; low-ranking officials and policemen ... and pub patriots of all kinds disturbed by the sight of 'upstart' workers, students and Jews challenging the God-given power of the tsar." "The old familiar picture! The police organises the pogrom beforehand. The police instigates it: leaflets are printed in government printing offices calling for a massacre of the Jews. When the pogrom begins, the police is inactive. The troops quietly look on at the exploits of the Black Hundreds. But later this very police go through the farce of prosecution and trial of the pogromists. The investigations and trials of pogromists conducted by the officials always end in the same way: the cases drag on, none of the pogromists are found guilty. Sometimes even the battered and mutilated Jews and intellectuals are dragged before the court, months pass—and the old, but ever new story is forgotten, until the next pogrom." The author of this article, written in June 1906, was Lenin. Rather than permit his thesis of the uniqueness of German anti-Semitism to be disturbed by the intrusion of historical facts, Goldhagen simply avoids any reference to the worst outbreaks of anti-Jewish violence in Europe prior to the establishment of the Third Reich. Pogroms were unleashed throughout the Russian Civil War, perpetrated by virtually every competing faction, from Polish and Ukrainian nationalists to the Red and White Armies. 31,071 civilian Jews were killed during documented pogroms throughout the former Russian Empire; the number of Jewish orphans exceeded 300,000. Majority of pogroms in Ukraine during 1918–1920 were perpetrated by the Ukrainian nationalists, miscellaneous bands and anti-Communist forces. (Click here for videos) The Soviet authorities considered the use of Hebrew language "reactionary" since it was associated with both Judaism and Zionism, and the teaching of Hebrew at primary and secondary schools was officially banned by the Narkompros (Commissariat of Education) as early as 1919, as part of an overall agenda aiming to secularize education. Hebrew books and periodicals ceased to be published and were seized from the libraries, although liturgical texts were still published until the 1930’s. Despite numerous protests in the West, teachers and students who attempted to study the Hebrew language were pilloried and sentenced for "counter revolutionary" and later for "anti-Soviet" activities. The Molotov-Ribbentrop pact—the 1939 non-aggression pact with Nazi Germany—created further suspicion regarding the Soviet Union's position toward Jews. According to the pact Poland, the nation with the world's largest Jewish population, was divided between Germany and the Soviet Union in September 1939. While the pact had no basis in ideological sympathy (as evidenced by Nazi propaganda about "Jewish Bolshevism"), Germany's occupation of Western Poland was a disaster for Eastern European Jews. Evidence suggests that some, at least, of the Jews in the Eastern Soviet zone of occupation welcomed the Russians as having a more liberated policy towards their civil rights than the preceding antisemitic Polish regime. Jews in areas annexed by Soviet Union were deported Eastward in great waves; as these areas would soon be invaded by Nazi Germany, this forced migration, deplored by many of its victims, paradoxically also saved the lives of a few hundred thousand Jewish deportees. Over two million Soviet Jews are believed to have died during the Holocaust, second only to the number of Polish Jews to have fallen victims to Hitler. Among some of the larger massacres in 1941 were: 33,771 Jews of Kiev shot in ditches at Babi Yar; 100,000 Jews and Poles of Vilnius killed in the forests of Ponary, 20,000 Jews killed in Kharkiv at Drobnitzky Yar, 36,000 Jews machine-gunned in Odessa, 25,000 Jews of Riga killed in the woods at Rumbula, and 10,000 Jews slaughtered in Simferopol in the Crimea. Though mass shootings continued through 1942, most notably 16,000 Jews shot at Pinsk, Jews were increasingly shipped to concentration camps in German Nazi-occupied Poland. "The Hitlerist bandits committed mass murder of the Jewish population. They announced that on September 29, 1941, all the Jews were required to arrive to the corner of Melnikov and Dokterev streets and bring their documents, money and valuables. The butchers marched them to Babi Yar, took away their belongings, then shot them." "The Hitlerist bandits brought thousands of civilians to the corner of Melnikov and Dokterev streets. The butchers marched them to Babi Yar, took away their belongings, then shot them." Though communist leaders including Joseph Stalin publicly denounced antisemitism, instances of antisemitism on Stalin's part have been witnessed by contemporaries and documented by historical sources. The 1917 Russian Revolution overthrew a centuries-old regime of official antisemitism in the Russian Empire. The success of the Soviet Union in dealing with this previous legacy of antisemitism, as well as the extent that the Soviet government fought against this prejudice, is a topic of some debate. Although officially forbidden as a form of ethnic and racial chauvinism, antisemitism was commonly used as an instrument for personal conflicts in the Soviet Union, starting from conflict between Joseph Stalin and Leon Trotsky and continuing through numerous conspiracy theories spread by official propaganda. Antisemitism in the Soviet Union reached new heights after 1948 during the campaign against the "rootless cosmopolitan", in which numerous Yiddish-writing poets, writers, painters and sculptors were killed or arrested This culminated in the so-called Doctors' Plot, in which a group of doctors (some of whom were Jewish) had allegedly conspired to murder Stalin. Soviet anti-Zionism was a propaganda doctrine promulgated in the Soviet Union during the course of the Cold War and intensified after the 1967 Six Day War. It was officially sponsored by the Department of Propaganda of the Communist Party of the Soviet Union and by the KGB. It alleged that Zionism was a form of racism and argued that Zionists were similar to Nazis. The Soviet Union framed its anti-Zionist propaganda in terms of the ideological doctrine of Zionology, in the guise of a study of modern Zionism. Anti-Zionist Committee of the Soviet Public was a body formed in 1983 in the Soviet Union as an anti-Zionist propaganda tool. The word "Jew" was also avoided in the media when criticising undertakings by Israel, which the Soviets often accused of racism, chauvinism etc. Instead of Jew, the word Israeli was used almost exclusively, so as to paint its harsh criticism not as antisemitism but anti-Zionism. More controversially, the Soviet media, when depicting political events, sometimes used the term 'fascism' to characterise Israeli nationalism (e.g. calling Jabotinsky a 'fascist', and claiming 'new fascist organisations were emerging in Israel in the 1970s' etc.). A mass emigration was politically undesirable for the Soviet regime. As increasing numbers of Soviet Jews applied to emigrate to Israel in the period following the 1967 Six Day War, many were formally refused permission to leave. A typical excuse given by the OVIR (ОВиР), the MVD department responsible for the provisioning of exit visas, was that persons who had been given access at some point in their careers to information vital to Soviet national security could not be allowed to leave the country. After the Dymshits-Kuznetsov hijacking affair in 1970 and the crackdown that followed, strong international condemnations caused the Soviet authorities to increase the emigration quota. From 1960 to 1970, only 4,000 people left the USSR; in the following decade, the number rose to 250,000. In 1972 the USSR imposed the so-called "diploma tax" on would-be emigrants who received higher education in the USSR. In some cases, the fee was as high as twenty annual salaries. This measure was possibly designed to combat the brain drain caused by the growing emigration of Soviet Jews and other members of the intelligentsia to the West. Though Jews now made up less than 1% of the population, some surveys have suggested that around one-third of the emigranting Jews had achieved some form of higher education. Furthermore, Jews holding positions requiring specialized training tended to be highly concentrated in a small set of specialties, including medicine, mathematics, biology and music. Following international protests, the Kremlin soon revoked the tax, but continued to sporadically impose various limitations. At first almost all of those who managed to get exit visas to Israel actually made aliyah, but after the mid-1970s, most of those allowed to leave for Israel actually chose other destinations, most notably the United States. In 1989 a record 71,000 Soviet Jews were granted exodus from the USSR, of whom only 12,117 immigrated to Israel. At first, American policy treated Soviet Jews were refugees and allowed unlimited numbers to emigrate, but this policy eventually came to an end. As a result, more Jews began moving to Israel, as it was the only country willing to take them unconditionally. In the 1980s, the liberal government of Mikhail Gorbachev allowed unlimited Jewish emigration, and the Soviet Union itself collapsed in 1991. As a result, a mass emigration of Jews from the former Soviet Union took place. Since the 1970’s, over 1.1 million Russians of Jewish origin immigrated to Israel, of whom 100,000 emigrated to third countries such as the United States and Canada soon afterward and 240,000 were not considered Jewish under Halakha (Jewish law), but were eligible under the Law of Return due to Jewish ancestry or marriage. Since the adoption of the Jackson–Vanik amendment, over 600,000 Soviet Jews have emigrated. Jews make up about 0.16% of the total population of Russia, according to the 2002 census. Most Russian Jews are secular and identify themselves as Jews via ethnicity rather than religion, although interest about Jewish identity as well as practice of Jewish tradition amongst Russian Jews is growing. The Lubavitch has been active in this sector, setting up synagogues and Jewish kindergartens in Russian cities with Jewish populations. In addition, most Russian Jews have relatives in Israel. Since the dissolution of the USSR, democratization in the former USSR has brought with it a good deal of tragic irony for the country's minorities, especially the Jewish population. The absence of Soviet-era repression exposed the remaining Jews to a resurgence of antisemitism in the former Soviet Union. However, there has not been a return to mass antisemitic incidents in Russia or anywhere else throughout the former Soviet Union. There are several major Jewish organizations in the territories of the former USSR. The central Jewish organization is the Federation of Jewish Communities of the CIS under the leadership of Chief Rabbi Berel Lazar. A linguistic distinction remains to this day in the Russian language where there are two distinct terms that correspond to the word Jew in English. The word еврей ("yevrey" - Hebrew) typically denotes a Jewish ethnicity, as "Hebrew" did in English up until the early 20th century. The word иудей ("iudey" - Judean, etymologically related to the English Jew) is reserved for denoting a follower of the Jewish religion, whether ethnically Jewish or not; this term has largely fallen out of use in favor of the equivalent term иудаист. For example, according to a 2012 Russian survey, евреи account for only 32.2% of иудаисты in Russia, with nearly half (49.8%) being ethnic Russians (русские), although many of these ethnic Russians could be Subbotniks of entirely non-Jewish background. An ethnic slur, жид (borrowed from the Polish Żyd, Jew), also remains in widespread use in Russia. American Jewry formed the mirror-image of RUSSIAN Jewry. In America a Jew helped to own his country; in Russia he was owned by it. The Soviet Jew was possessed, a property of the state, as he had been in the Middle Ages. One of the lessons we learn from studying Jewish history is that anti-Semitism corrupts the people and the societies possessed by it. It corrupted a Dominican friar as effectively as it corrupted a greedy king. It turned the Nazi state into a heaving mass of corruption. But nowhere were its corrosive effects more apparent than in Russia. The ubiquitous petty corruption engendered by the Tsarist laws against the Jews has already been noted. More important in the long run was its moral corruption of state authority. For in harassing the Jews, the Tsarist Russian state became habituated to a close, oppressive and highly bureaucratic system of control. It controlled internal movements and residence of the Jews, their right to go to school or university and what they studied there, to enter professions or institutes, to sell their labour, to start businesses or form companies, in worship, to belong to organizations and to engage in an endless list of other activities. This system exercised monstrous, all-pervading control of the lives of an unpopular and underprivileged minority and a ruthless invasion of their homes and families. As such, it became a bureaucratic model, and when the Tsars were replaced first by Lenin, and then by Stalin, the control of the Jews was extended to the control of the entire population, and the model became the whole. In this system, in which all were harried and all underprivileged, the Jews were further depressed to form a sump or sub-class in which the degree of state control was deliberately intense. Stalin died before the doctors came to trial and the proceedings were quashed by his successors. The plan for a mass deportation came to nothing. But it was significant that anti-Semitism was not one of the aspects of Stalin’s behaviour Nikita Khrushchev denounced in his famous Secret Session speech. As first secretary in the Ukraine he shared the endemic anti-Semitism there and, immediately after the war, had stopped returning Jewish refugees from claiming their old homes. ‘It is not in our interests’, he stated, ‘that the Ukrainians should associate the return of Soviet power with the return of the Jews. Indeed there were several post-war Ukrainian pogroms under Khrushchev’s rule. Once in power, he switched the thrust of anti- Jewish propaganda from spying to ‘economic criminality’, large numbers of Jews, their names prominently displayed, being convicted and sentenced to death in nine show-trials. He closed down many synagogues, their total falling during his rule from 450 to sixty. He permitted the publication, by the Academy of Sciences of the Ukrainian Soviet Republic, of the notorious anti-Semitic tract, Judaism Without Embellishment, by the Communist Rosenberg, Trofim Kychko. The Khrushchev era witnessed an outbreak of blood libels, anti-Semitic riots and synagogue burning. The Soviet campaign against the Jews, after 1967 a permanent feature of the system, was itself conducted under the code-name of anti-Zionism, which became a cover for every variety of antisemitism Soviet anti-Zionism, a product of internal divisions within the east European Jewish left, was in turn grafted on to Leninist anti- imperialism. At this point we need to retrace our steps a little, in order to show that the Leninist theory of imperialism, like Marx’s theory of capitalism, had its roots in anti-Semitic conspiracy theory. The Subbotniks (Russian: Субботники meaning literally Sabbatarians) are a Judaizing Christian sect originating in Russia categorized by Velvl Chernin into Talmudist-Subbotniks (Gers) and Karaite-Subbotniks which split from other Sabbatarian Christians in the 19th century. This article deals mainly with the Talmudist Subbotniks. On the whole, the Subbotniks probably differed little from other Judaizing societies in their early years. They first appeared toward the end of the 18th century during the reign of Catherine II. According to official reports of the Imperial Russian government, most of the sect's followers circumcised their boys, believed in a unitary God rather than in the Christian Trinity, accepted only the Jewish Bible (Old Testament), and observed Sabbath on Saturday rather than on Sunday as in Christian practice. (Some were called sabbatarians for that practice.) There were variations among their beliefs in relation to Jesus Christ, the Second Coming, and other elements of Orthodox Christian doctrine. Prior to the First Partition of Poland in 1772, few Jews had settled in the Russian Empire. The Subbotniks were originally Christian peasants of the Russian Orthodox Church. During the reign of Catherine the Great (1729-1796), they adopted elements of Mosaic law of the Old Testament and were known as sabbatarians, part of the Spiritual Christianity movement. Subbotnik communities were among the earliest to adopt Zionism; a significant number settled in Ottoman Palestine in the 1880s as part of the First Aliyah in order to escape oppression in the Russian Empire. Their descendants included Israeli Jews such as Alexander Zaid, Rafael Eitan and Major-General Alik Ron. A 1912 census in Russia recorded 8,412 Subbotniks who "had fallen away from Orthodoxy"; 12,305 "Judaizing Talmudists"; and 4,092 "Russian Karaites". Karaite Judaism (sometimes referred to as Karaism) is a Jewish heretical movement that recognizes only the Bible as a source for legal authority, as opposed to mainstream Judaism, which considers the Oral Torah (as codified in the Talmud) as authoritative in decisions regarding Jewish Law. Historians believe that Karaite Judaism began in Baghdad in the 8th century CE. Its founder, Anan Ben-David, was bitter at having been passed over for a leadership position in the Jewish community, so he broke away and formed his own sect which eventually came to be known as the Karaites. At its height, the movement may have commanded a not-insignificant percentage of world Jewry. But the number of adherents dwindled significantly over time, and there are now just an estimated 30,000–50,000 Karaites left, most living in Israel, with smaller communities in Turkey, Europe and the United States.